Veganism has never been more popular with more than half a million Brits now choosing to avoid food derived from animals. If you’re one of the people who’s new to the lifestyle, knowing what to eat on a daily basis while keeping your body healthy can be an absolute minefield. As part of their latest report the team at Viva! Health have created a handy infographic suggesting what you should eat each day to help. 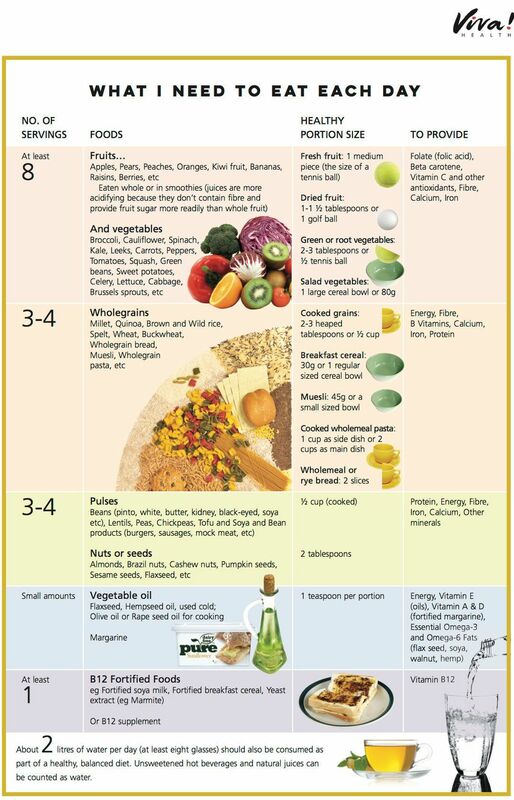 The graphic suggests people following a vegan diet should eat eight portions of fruit and veg per day, three to four portions of wholegrains and three to four potions of pulses. It also advises those going vegan eat vegetable oil in small amounts and at least one portion of fortified foods every day or a vitamin B12 supplement. British Dietetic Association spokesperson Frankie Phillips says the graphic is a “reasonable start” if you want to go vegan, but you should also seek advice from your GP or The Vegan Society before finalising your shopping list. “A vegan diet can be healthful, but it does take more effort and you need to be quite careful you’re replacing the sources of several nutrients you would normally get from meat, dairy, eggs or fish. That is quite tricky unless you’ve had some advice,” she tells The Huffington Post UK. Phillips points out that vitamin B12 is completely missing from a vegan diet. “If you’re vegan you will not have any sources of natural B12 in your diet, and that can lead to types of anaemia and nerve damage, so it is very important that you have a source of B12,” she explains. For anyone considering going vegan who hasn’t yet taken the plunge, Phillips recommends transitioning slowly over time. “It might be worth looking at more of a plant-based diet, without necessarily becoming vegan, as an intermediate step,” she says.